Read here how to use this guide to help you choose a label size and get the best price as we likely already have the cutter. ..... or Scroll down to see the cutter list. Please read over these notes to help you appreciate how we work to bring you top quality labels at best prices and to avoid any selection error, then scroll down to choose your size from around 5000 sizes !....... see if you can find the size needed and request a quotation. Then call us 01527 529713 ask for label quotations or email Abi on labelsales@ktecgroup.co.uk...... you can drag and highlight then right click / copy the chosen line from the size ordered cutter list then come back and click contact page then paste into the subject line and add you notes and send. Tell us for what printer and application and if possible approximate yearly consumption so we can work a very best price for your supplies. As one of the largest largest specialist manufacturers and distributors of labels on rolls for digital labels printers we have large stocks of materials selected and tested for use in ink jet, laser and thermal / thermal transfer printers. We cut your labels in self adhesive paper, polyester or polypropylene with a choice of finishes including matt, satin(semigloss), high gloss and clear. Labels arrive at your site protected in in storage boxes and ready wound to rolls to suit your printer model, please specify make and model. We quote in batches for your best price like 2k, 5k, 10k, 20k, 50k, 100k, 250k, 500k, 1000k, 2000k, or please ask if any special quantity needed. For each size needed we can accommodate 4 batch sizes for choice on each quotations, ideally which batch sizes do you need? be sure to let us know the quantity used or estimated per year so we can buy master rolls in bulk at bets prices and offer the best price for the cut labels you need. Matching Ink or Toner or Ribbons are available from stock for our supported label roll printers. Important: when labelling a bottle, jar or other cylinder! where the label wraps round the product you need to choose the size as LEADING EDGE FIRST so for example the label 38 x 200, is 38 width of roll for height up the bottle and 200 is the wrap around length), a label specified as 200 x 38 is incorrect. 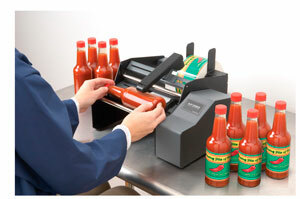 Labels wound correctly can then be used in our range of hand guns, table top dispensers and automated label applicators to speed up production. For the inter label gap we try to standardise on 3mm unless shown in notes as a special. and simple to register in the printer. For example a round label or other difficult shape is often 'kiss cut' into a slightly larger square label for this purpose. THE CUTTER LIST shows the label Width first, followed by Length, followed by how many across on our tool (can be slit to number across needed say 1 to max number shown), also shown are any special Notes and the Tool Number to quote us. If there is only one dimension its probably a round / circle label see the notes alongside. SIZE (MM) BY (MM)" NUMBER ACROSS WE MAKE MAX BUT CAN SLIT TO DESIRED NUMBER, DESCRIPTION, MATERIAL , TOOL No.